Typically, after ensuring that you have your squad in place for your wedding, what your bridesmaids will dress in becomes of much importance. You want to make sure that you get everything right. This calls for precision when picking beach wedding bridesmaids’ dresses. If you have been at a beach wedding, then you understand how different it is compared to a church or indoor wedding. At the beach, you will need to consider a few factors now that you will be dealing with Mother Nature first hand. The best route would be to complement the natural scene. The best way to do this is to ensure that both you and your bridesmaids are at the line-front. There is no doubt there is much to consider when coming up with the right attire for beach wedding bridesmaids which can be hectic. To help you out, these tips should put you in the right track. Read on. As mentioned before, the fact that a beach wedding is held outdoors calls for the need to consider a number of factors. The first and foremost significant aspect is the weather. In what season will you be holding the wedding? What is the weather like in the destination you chose? Beach wedding bridesmaids’ dresses with loose skirts and low backs will not only make them stylish but also comfortable on a hot day. What’s more, a staggered hemline can be ideal for the dresses to swing with the gust from the sea. 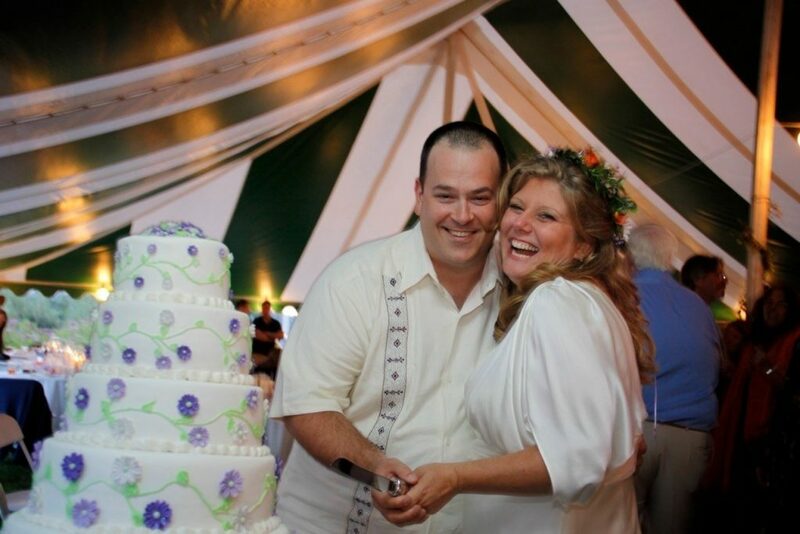 Beach weddings are usually held in sunny afternoons and evenings thus the need for aeration. That is why light fabrics with a flowing design are highly recommended. They give the impression of the summer, and there is no doubt that your bridesmaids will be happy with them. The light fabrics make the dresses breathable. Elegant beach wedding bridesmaids’ dresses flow with the sea breeze, but precautions need to be taken. Wind at the beach is known to be the cause of wardrobe malfunctions. Make sure that the dresses come with an undershirt that fits a little tighter to the body. This will come in handy when the gust kicks in and takes the dresses up with itself. One of the best fabrics for bridesmaids’ dresses is chiffon. While it is light and flowing, it also has a cooling effect on the body, the kind you need at the beach. Other fabrics like silk can be less breathable and heavy ones like cotton are a no-no for the beach wedding outfits. Short beach wedding bridesmaids’ dresses are the best picks for beach weddings for more reasons than one. First, you don’t want the dresses to keep dragging in the sand and get wet. The consequence of this is dirty and heavy dresses which cannot be used for the reception afterwards. Furthermore, maxi dresses are likely to cover the shoes that you selected for your bridesmaids not to mention cause trip-offs when walking down the aisle. As such, the best option is to go with short and sweet dresses. But how short is short? Tea or knee length should be perfect. Allow your bridesmaids to choose the design of the dress that best suits their body types. Finding a one-fits-all is almost an impossibility. This, however, does not mean that everyone will choose something overly different, no. A few essential aspects will be standard across the board with the design tailored to complement the individual body types. 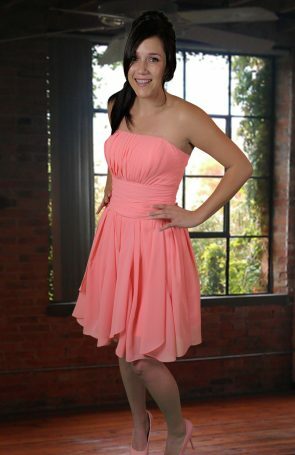 For instance, bridesmaids with a heavy top will look best in dresses with straps. Fit and flare dresses will be the best pick for pear-shaped bridesmaids. Also, if your girls are tall and slender, dresses with bubble hemlines can go a long way in adding the impression of volume and curves in the mix. The idea here is to make sure that your bridesmaids are not only comfortable in what they wear but also confident and feel beautiful. If, however, you insist on ensuring some sort of formality in how your bridesmaids dress, you can alter the neckline accordingly. This would essentially mean that you vary the use of straps and also consider using halter top. Bear in mind that the way your bridesmaids feel will contribute a lot to the success of your wedding. While there is need to be creative, make sure you don’t sacrifice the theme of the wedding. It is imperative to always ensure the theme of the wedding when buying beach wedding bridesmaids’ dresses. This is so, even if you want to alter the design to suit each of your girls, as mentioned before. 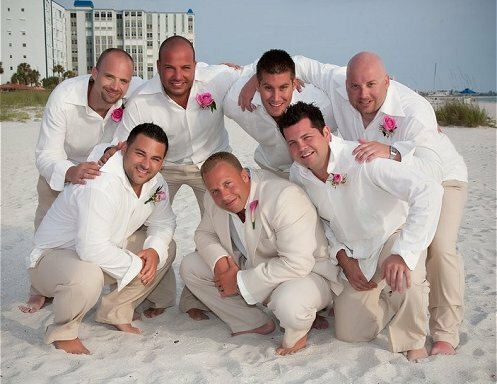 Many people have different themes for their beach weddings. They can be bohemian, Hawaiian, romantic or nautical among others. The best way of ensuring that your bridesmaids are at par with you regarding the theme is to remain subtle in the details. Even if it only includes a lining along the hem or the straps, the effect will for sure be felt. The fact that you will be using the beach as the venue makes it vital that you use colors which will complement those in the beach setting. The good thing is that your venue will have natural colors for which to find complements should not be a big challenge at all. Yet still, you will need precision when coming up with the color of your bridesmaids’ dresses. Look to nature to get the best ideas for the shades to use. For instance, black is a neutral color alright, but in the case of a beach wedding; it may look a little out of place. The same is true about dark browns. The other mistake many people make is to think that any brightly colored dress will make the cut but red isn’t really a good choice, is it? Colors like blue, purple, soft green and cream for beach wedding bridesmaids’ dresses stand out and make the right statement in the natural setting. A wedding on the beach makes it more casual compared to one held in a church, and as such, your dressing will more likely be casual as well. The same is true for your bridesmaids and overdressing them is definitely not the right way to go. Choose something that will go well with the relaxing ambiance of the beach such as casual white beach dresses. 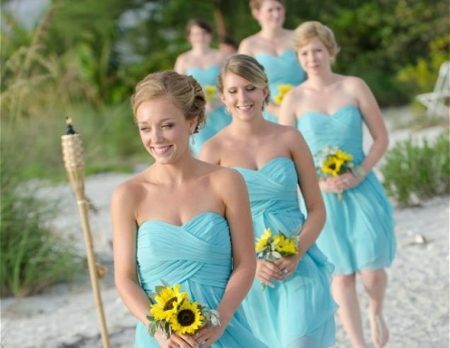 Simple and casual beach wedding attire for bridesmaids with no straps and clean lines can contribute a lot to making the event colorful, fun, and relaxed thanks to the beach while ensuring that it remains as special as you want it to be. Hitherto, it is clear that you need precision if getting the best dresses for your bridesmaids is anything you want to achieve. The good thing is that you don’t have to be a specialist in matter beach weddings since the procedure is rather simple and straightforward. These tips should come in handy when picking the dresses your bridesmaids wear on your special day. To make matters better, we at Wedding Tropics stock a wide variety of beach wedding bridesmaids’ dresses for you to choose from. Better yet, you have the option to have your orders tailored and delivered on time for your upcoming wedding by the beach. Check out our collection of gorgeous bridesmaids’ wedding clothing and other posts for more on beach weddings. “I just wanted to let you know that the shirts arrived today. Thank you for your attention to this matter. I do greatly appreciate it. The shirts are beautiful, by the way!